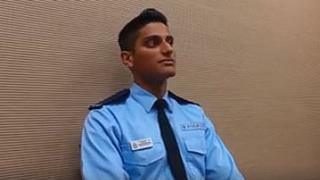 A 20-year-old Hong Kong policeman has swept to fame online after he talked a suicidal Pakistani man out of killing himself - in fluent Urdu. The young man joined the force just under a year ago, and is said to be the only officer of Pakistani origin in the district. He arrived via a Hong Kong police scheme to recruit non-Chinese officers, called Operation Gemstone. Constable Zaffer's handling of the delicate situation won him praise from superiors - and a social media fanclub. "He is very handsome yet having a golden heart," gushed Facebook user Nuna Priya. "Mr IFZAL ZAFFAR, many citizen support you, pls keep on serving the society. Thanks!!!" wrote Baba Bebe Wong. As netizens commended his integrity and professionalism, the Muslim Council of Hong Kong also joined the chorus of support. "Bravo to this young man and thank you to the HK police force for bringing him in," it said. "Hope more such stories can be seen to show HK is indeed a multi-cultural city."